April 12, 2018 - Spring means a return to the famed Atlanta Motorsports Park for the 2018 World Karting Association (WKA) Vega Tire National Road Racing Series for the third stop of the program. With the April 23 pre-entry deadline fast approaching, WKA is adding additional benefits for road racing participants. All pre-entries for the event will be entered into a pair random drawings that will award two lucky racers each a free entry for the 2018 WKA Daytona Kartweek this December. Racers will receive a drawing ticket for each class they pre-enter by the April 23 deadline. The more classes pre-entered, the more drawing tickets an entrant will receive. The drawings will be conducted at each of the driver’s meetings on both Saturday and Sunday in Atlanta. Additionally, for the Atlanta Motorsports Park event, WKA is extending an invitation to new members, or members who have not renewed their membership in the past 12 or more months, with a $20 temporary membership to participate in the event. Should these new or returning members wish to turn their temporary membership into a WKA annual membership, they may do so before May 31st and apply the $20 to their annual membership application. Echoing Williams’ remarks, WKA invites sprint racers to give road racing a try. Just a couple easy modifications that a sprint karter’s local kart shop can help them with will get them enjoying the road race event from the first green flag. What’s more, sprint racers wanting to try road racing for the first time can enjoy the same new benefits mentioned above. 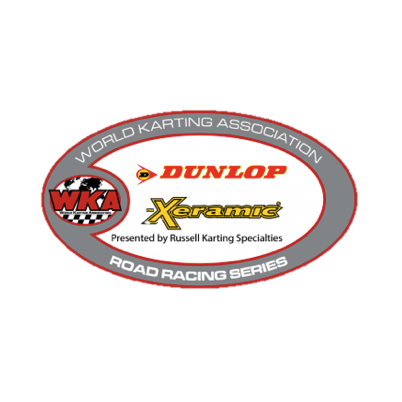 Entry forms and additional information are available by following the series link to the WKA Vega National Road Racing Series on the WKA website at www.WorldKarting.com. CONCORD, NC - Even Hurricane Irma couldn’t stop the freight train that IS Jason Lorang, as the Midwest racer capped off an amazing season, full of travel, with a car loaded with hardware, and wins totalling double digits, including 2 more in the West Texas Outlaws TaG Heavy class, as the Dunlop/Xeramic National Road Race Series, presented by Russell Karting, wrapped up its 2017 national season at Atlanta Motorsports Park. In addition to the sweep by Lorang in the TaG Heavy class, Stephen Wheatley returned to Road Race competition, as the Georgia driver swept the Hoosier Racing Tire Animal Heavy class. Other multiple winners over the weekend included James Cartledge in Clone LO206 Heavy, Hall of Famer Randy Fulks in Yamaha Sportsman Heavy competition, Bill Anderson in Yamaha Senior, and Tony Wimmer in the Animal Medium class. Coming into the TaG Heavy finale, Lorang held a pretty healthy lead over his closest challenger in Gary Sircy. While sweeping the Animal Medium class both days, as mentioned earlier, Tony Wimmer also helped himself to a pair of runner-up finishes both days, chasing Lorang across the stripe. Brad Adams, Sircy, and John Bryant were the top 5 on Day 1, while the Day 2 top 5 were Bryant, Sircy, and Ashley Michel. The other title Lorang was chasing was in the KALL Racing/Millers Dynotime Racing Formula 100 class, where Travis Miller and Rick Fulks snared the weekends top honors. Lorang chased Miller to the win on Saturday, while finishing third to Fulks and Sean O’Shea in the Sunday finale. And where there is one Fulks winning, there typically is the other, as brother Randy swept the Yamaha Sportsman Heavy class for the weekend, topping Matt Michel and Bill Holder on Day 1. The Sunday finale found Fulks topping Chad Dokken and Bill Holder. The wins for Fulks are one thing. Fulk’s unselfish actions are yet another, as for the second straight year at the Grand National, Fulks donated his Grand National Eagles to the future of the sport, as competitors in the Cadet LO206 Class were presented an award by one of the most prolific drivers in the history of the sport. One of those drivers to receive a Fulks Eagle last year was young Madison Wheatley. Since then, Madison has graduated up into the next age group, and thus scored a pair of wins herself, taking the TaG Junior and Junior Sprint wins over the weekend. While Madison was busy winning, Dad Stephen also made a triumphant return to Road Race competition, taking both days in the Hoosier Racing Tire Animal Heavy class, besting the father/son duo of Rob and Robert Garland, who were in the midst of an extremely tight points battle coming into the weekend. Day 2 found Wheatley back on top, followed by Robert Garland, Rob Garland, Steve Johnson, and Ben Thomason. With just 30 points separating James Cartledge from catching Andrew Boyer in Clone LO206 Heavy action, Cartledge took full advantage of Boyers absence, taking down the wins in the class both days. Other classes that were tight coming into the weekend included B Stock, where Robby Harper III held a 35 point edge over Dad Robby, with the elder Alabama statesman taking the win over his son, while Jim Farr Jr, Tom O’Reilly, and Eric Harper completed the top 5. X30 Laydown was also fairly tight between veteran Gary Schenkel and JC Sanders, as 47 points separated the two coming in. With both on hand, they did not disappoint, both taking a win, Sanders on Saturday over Schenkel, David McCauley, and Paul Wyzga, while Schenkel improved one spot on Sunday over Wyzga, Sanders, and McCauley. While the bulk of the Road Race competitors were able to attend the event, Hurricane Irma’s visit through Florida, and her ensuing effects, prevented some of the WKA Family from making the event, including the longtime loyal duo of Kerry and Lance Yunck, who were dealing with the devastation left in Florida in Irma’s wake. Lance also sported a 59 point edge over Sean O’Shea in the 100cc Controlled class coming into the finale. With Lance not able to attend, O’Shea was able to secure the Saturday win over Rick Fulks. Donald Santini came into Atlanta, sporting a 60 point edge over Thomas Dupont in the 125 Sprint Shifter class, with Tracy Phillips, Denver Liabenow, and Dingus Griffin a very tight top 5 in points. All 5 drivers were on hand with Liabenow taking the Saturday win over Griffin, with Bill Pyles, Dupont, and Santini the top 5. On Sunday, Steven Rougeou took down the win, topping Griffin, Liabenow, Dupont, and Phillips. Another class hanging in the points balance was the WT Racing IAME Sprint class, where points leader AJ Ellis took the Saturday win over Lee Curtis and Greg Heberle, while points runnerup Gary Sircy, trying to overcome a 73 point deficit, finished 10th. Day 2 found Heberle taking the win over Ellis, with Brad Adams, Sebastian Bushey, and Allan Dawson completing the top 5. Sircy was 9th. The Fisher Racing Engines Stock Honda class had a little bit more of a gap coming in, with Steven Rougeou sporting a 112 point lead over David Harding. Neither driver was able to secure a win, as Brian Fisher took Day 1 action over Stephen Flatt, Mark Nagy, Byron Rothenhoffer, and Rougeou, with Harding placing 6th. Day 2 found Rothenhoffer taking the win over Fisher, Harding, Todd Brown, and Ian Bushey, while Rougeou finished 9th. Bill Holder came into Atlanta with a 118 point edge over Georgian Matt Michel in the Competition Karting Incorporated Yamaha Sportsman Medium class. Neither driver was able to secure a win over the weekend, as Chad Dokken took the Day 1 honors over Michel, Jeramie Weeden, Lyle Trudell, and Holder, while Trudell rebounded for a win on Sunday over Donald Dump and Michel. Here’s a look at the balance of the winners over the weekend. On behalf of the World Karting Association, our extreme thanks to all who participated in the 2017 season, the many drivers, families, sponsors, crewmembers, officials, and so many other special people that make the Dunlop/Xeramic National Road Race Series so very special. Thanks to our sponsors.